Koshibo polyester fabric is a midweight woven fabric. It stocks clothing racks with both casual wear and elegant attire. Available in several finishes, the fabric holds color well and is suitable for printing. In the presence of microfiber technology, it may be best described as a traditional polyester fabric, strongly similar to those popular in the U.S. in the 1960s and 1970s. Koshibo polyester fabric can be practical, casual or elegant. Although information about koshibo manufacture seems to be closely held, it appears to be a direct descendant of dacron and other polyester fabrics developed and popularized in the U.S. during the 1950s through 1970s. These fabrics are based on filaments formed by chemical solution and extruded through fine screens, then spun into threads and yarns for fabrics. Filaments can be mechanically kinked to produce textures resembling natural materials like cotton and wool and left smooth to produce silklike results. Traditional polyester fabric has proven to be relatively inexpensive to manufacture, making it possible to create affordable clothing for large markets. Manufacturers stress the feel of koshibo. Finish names include the most-abundantly produced Peach and Silk Stone. The fabric can be produced in wide widths of 60 inches or more, making it suitable for household textiles like curtains and bedspreads. Its capacity for holding print makes it easy for manufacturers to offer a wide variety of prints and textiles. One of its strongest appeals is its ability to mimic the textures of more expensive fabrics. It can be produced in weights and finishes resembling silk, satin, suede, crepe and chiffon. 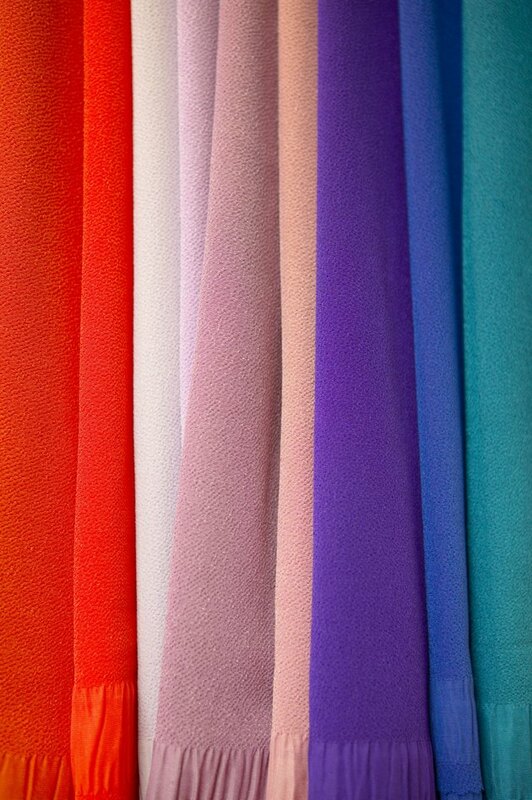 Polyester fabrics can be yarn-dyed, holding color well, with less fading than most natural fabrics. Although it lacks the stretchiness of polyester knits, this fabric drapes well and produces the effects of fragile lightweight textiles like silk chiffon or organza with greater durability. Its versatility and cost make it appealing to the evening wear market. While the cheap styling of many polyester double-knits lessened the fabric's popularity on the American market during the 1970s, woven polyester lost popularity because of its lack of breathability. Tight weaves produce attractive fabrics, often of light weight and texture, but create a steam-room effect for wearers. The irony of woven polyester's particular suitability to summer clothing is not lost on perspiring consumers. Koshibo shares this failing, although its low cost and ability to mimic the look and feel of more expensive fabrics continues to support its popularity. As a polyester, koshibo is often confused with the microfibers produced by new technologies. It is not a microfiber, which can easily be seen in thread weight and volume. Most koshibo fabric threads are 75 denier to 150 denier. By comparison, a human hair is approximately 1 denier, while sheer nylon stockings are 15 denier. Microfiber yarns are 0.5 denier or less. Microfibers address the breathability issue that traditional woven polyester does not, although technological and cost challenges may sustain the market for traditional polyesters for the future.